I really adore how this card came out, especially when I took it outside to photograph, the 3D elements cast wonderful shadows over the front of the stark white card stock giving it a completely different look to what I had imagined when I first thought of what to create. I hope you enjoy my shaker card creation and share with me what you create. 1: Cut a piece of Kraft card to 4 3/4inch x 6 3/4inch. A piece of white to 4 1/4inch square and 4 1/2inch x 6 1/2inch. 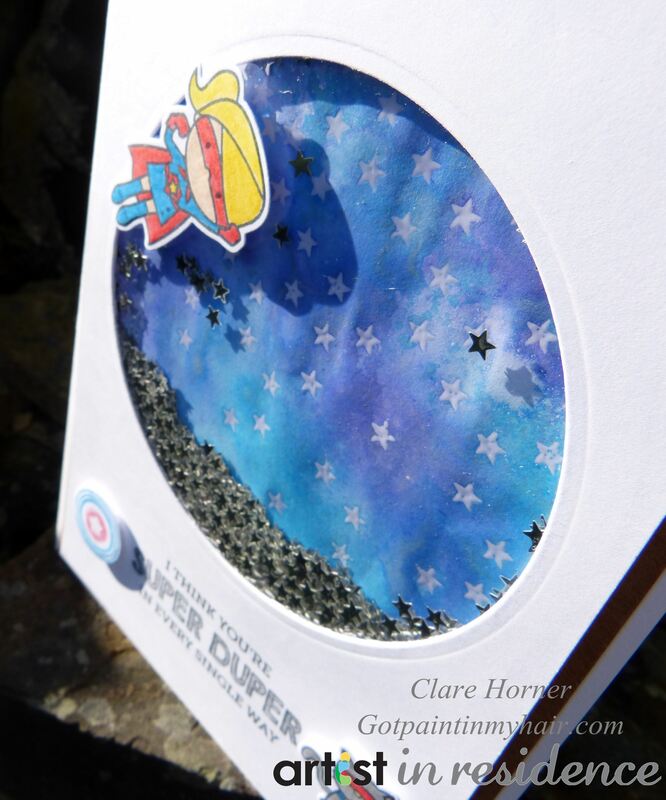 2: In the large white panel, cut the largest circle die centrally in the top portion of the card stock. Glue a piece of acetate to the reverse. 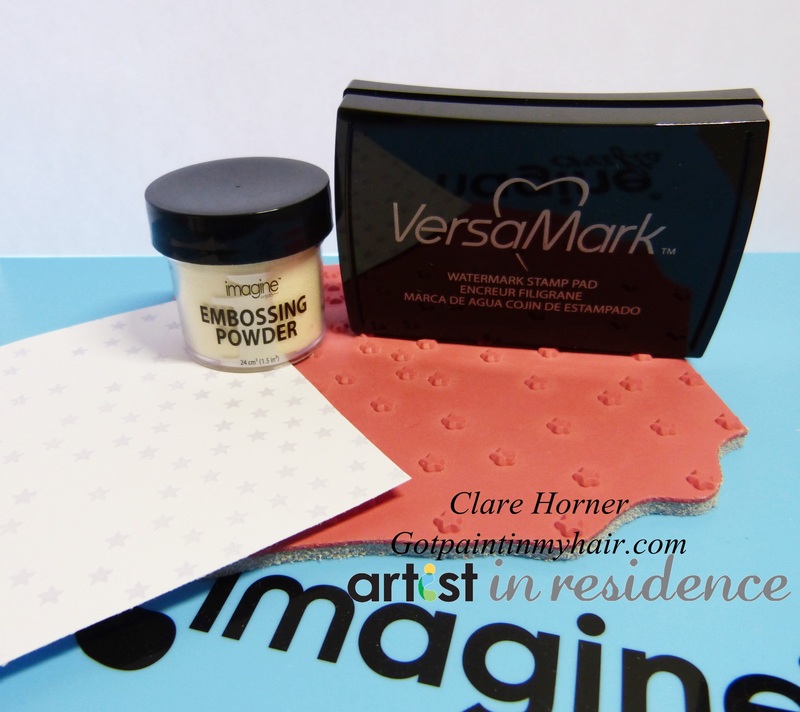 3: Stamp the small white card square with the falling stars stamp and embossing with clear embossing powder. 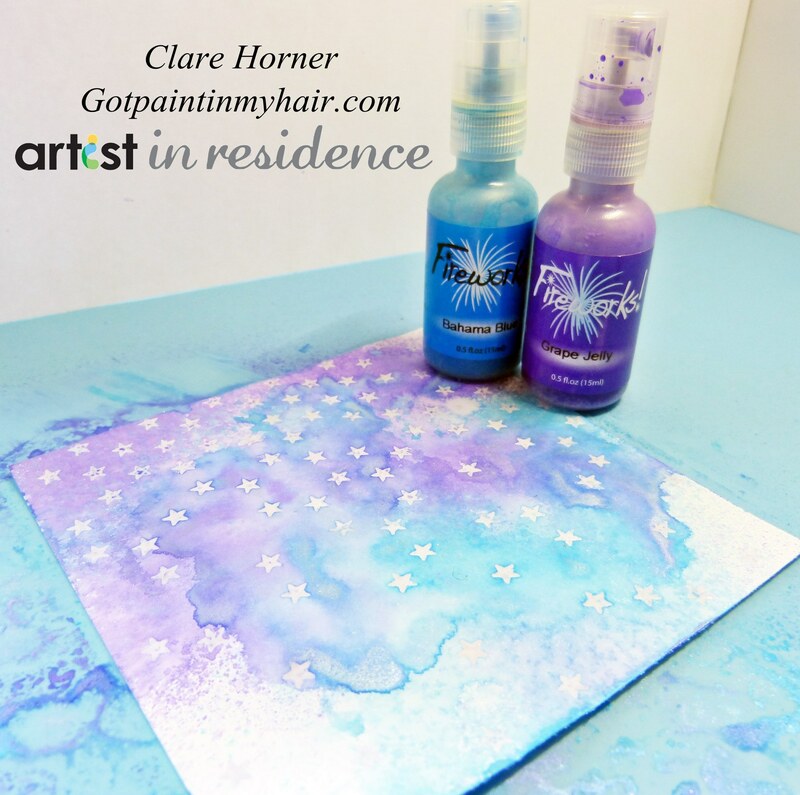 4: Spray the embossed piece with Fireworks Bahama Blue and Grape Jelly, disperse with water if required. Set aside to dry naturally. 5: Stamp the tiny heros girl and cat in Memento Tuxedo Black. Heat set and colour in with Memento Markers, Dandelion, London Fog,Bahama Blue, Lady Bug, Desert Sand. 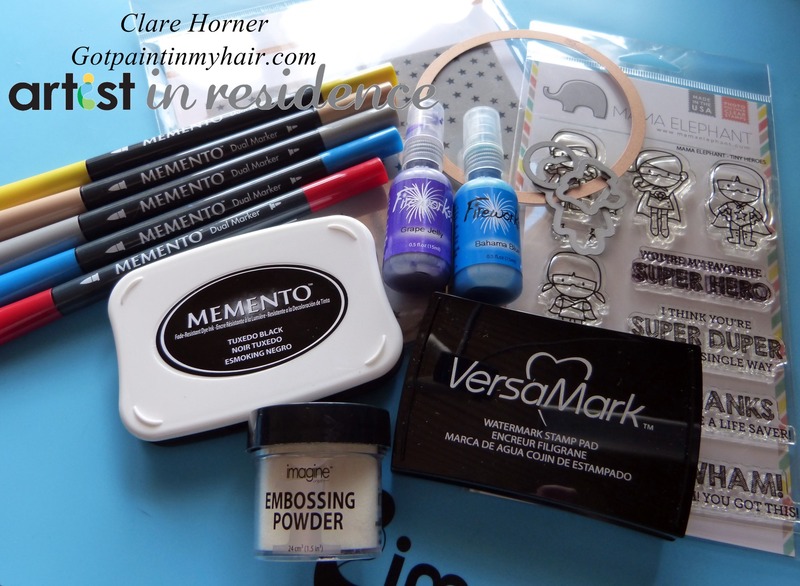 6: Ink up the tiny hero shield stamp with Memento markers in Lady Bug and Bahama blue, stamp and heat set. 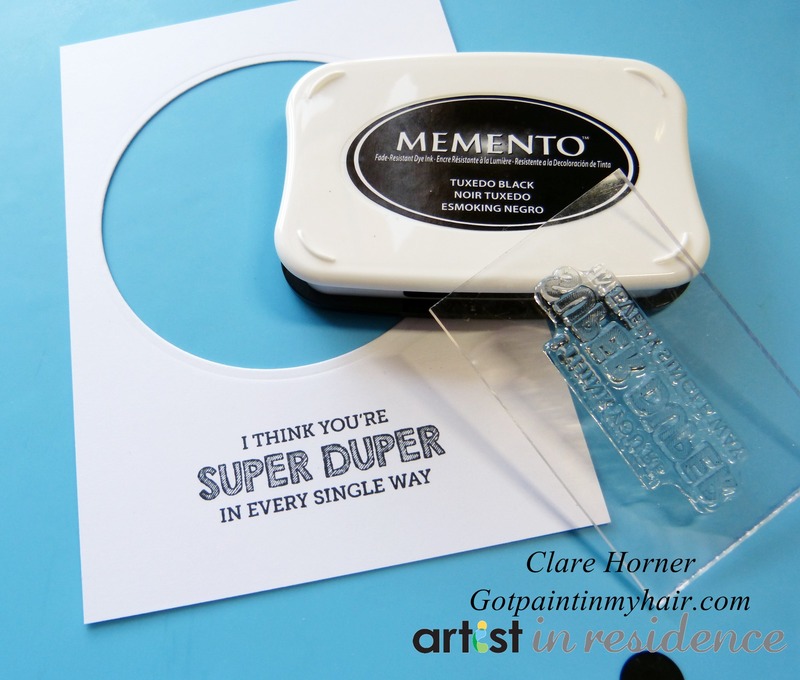 7: With Memento Tuxedo Black, stamp centiment centrally on the large pannel under the previously cut out hole. 8: Attach foam tape to the back of the from panel creating a wall around the cut out circle. Fill with a teaspoon or two of glitter stars. 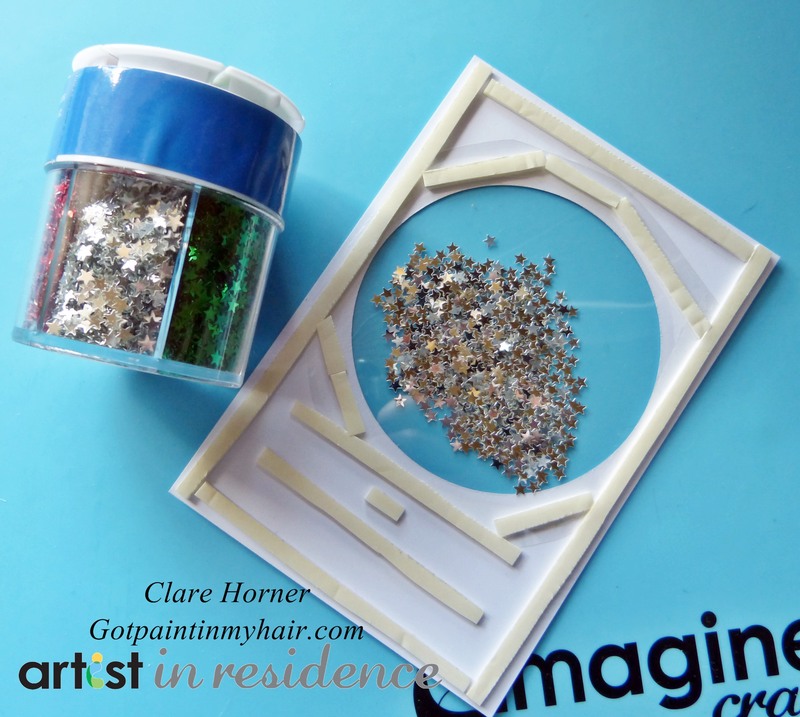 Attach the small card piece to secure glitter in place. 9: Attach the Kraft piece of card to card base, attach the completed shaker to the top. 10: Add foam tape to the back of the cat, shield and girl and stick in place. Shake and have fun! 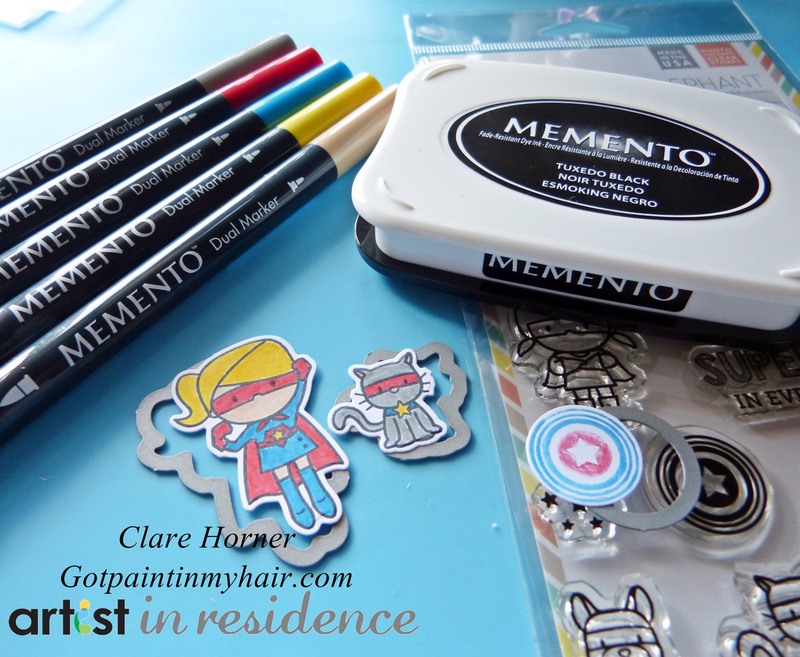 Memento Dual marker: Dandelion, London Fog,Bahama Blue, Lady Bug, Desert Sand. Dies: Spellbinders – Standard circles large. Mamma Elephant – Tiny Heroes. 5X7 card base, white card, kraft card, acetate. Die cutting machine, paper trimmer, heat gun, scissors.